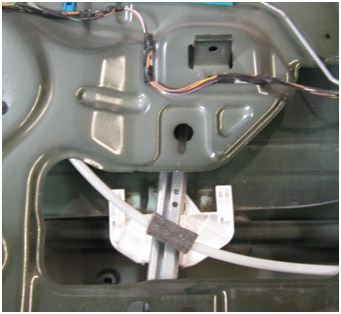 There were 2 types of window regulators installed in the 2006-2007 Jeep Liberty so it is important that you identify the right window regulator in your Liberty before ordering. While it is possible to determine which window regulator you may have based on your Liberty's build date, a visual inspection is the most accurate way to determine which type of regulator you have. 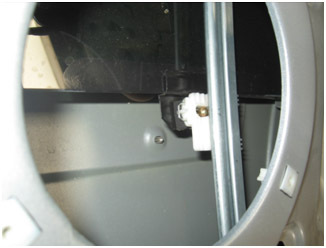 Below are pictures of the regulator and glass inside the door shell. 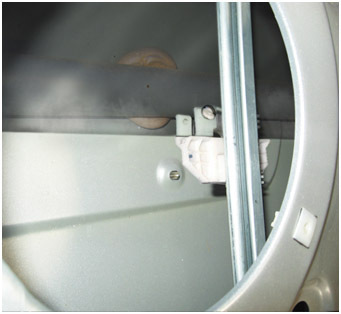 You will not need to remove them at this time, however you will need to remove the door panel, moisture shield and speaker (rear door only) to see the type of mount your regulator has. You may see this sticker on your door jamb if your 2006 or 2007 vehicle has had Technical Service Bulletin 23-014-08 or Technical Service Bulletin 23-008-09 performed for a faulty regulator. If so, the regulator and glass have been replaced with the Clip Mount type. Whether or not you see this sticker, a visual inspection is still recommended. 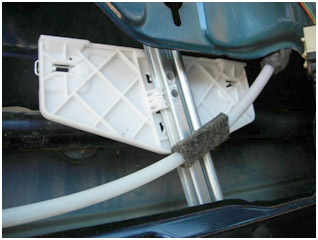 NOTE: The 2002-2005 Jeep Liberty all used the Clip Mount regulator but an inspection is best if your Liberty has been in a collision and a door was replaced with a used part. On the Clip Mount type regulator, the glass has a metal bracket attached to it on the bottom that will have studs, 2 for the front regulator and 1 for the rear, which allow it to be secured to the regulator glass guide with clips. This style glass/regulator combination was used on all 2002-2005 vehicles and 2006 models built before 3/16/06 [we recommend that if you have a 2006 model you perform the visual check regardless of the build date because we have found some reference material where the change occurs as early as 5/2/05 and as late as 2007 models]. This is also the regulator and glass used to replace defective units under Technical Service Bulletins 23-014-08 or 23-008-09. On the Hole Mount type regulator, the glass WILL NOT have a metal bracket on the bottom. Instead it has a hole in it that the regulator glass guide snaps into.